Background: Surgical care is associated with a considerable risk of complications and death that represents a substantial burden of disease worthy of attention from the public health community worldwide. A surgical checklist is an inexpensive tool that will facilitate effective communication and teamwork to prevent patient harm. Aim & Objectives: This study aims to improve the safety of surgical care to decrease morbidity and mortality associated with surgery at Zagazig University Hospital through the following objectives: 1- To assess the performance of surgical team (surgeons, anesthetists and nurses) about surgical safety before and after intervention. 2- To assess the incidence of major post-operative complications before and after intervention. 3- To assess surgical team attitude about patient safety in operating rooms (OR) before and after intervention. 4-To increase the awareness for all surgical team about surgical safety to decrease post operative complications. 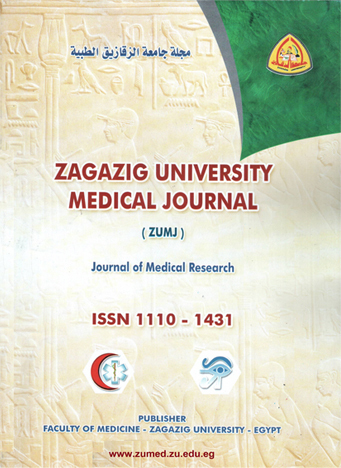 Subjects & Methods: an interventional study was conducted in general surgery department of Zagazig University Hospital during the Academic year 2012-2014. Comparing 157 patients before and 157 patients after intervention who are 16 years of age or older undergoing inpatient major surgical operation were consecutively enrolled in the study and all surgical teams (surgeons, anesthetists and nurses) of the selected group were included during the period of the study. The study was carried out through 3 phases. Results: Results of this study showed that there was a high statistically significant reduction in 30 days major post-operative complications after implementation of WHO surgical safety checklist, the total number of complications decreased from 50.96% to 27.39% (p = 0.0001), in-hospital mortality decreased from 3.18% to 0% (p = 0.02). There was statistical significant improvement of surgical team attitude about OR surgical safety after intervention (p<0.05), there was high statistical significant negative correlation between physician and nurse coordination and occurrence of postoperative complications(r= -0.27) (p<0.05). The checklist was considered easy to use by 94.6% of physicians, 62% of nurses. Conclusion: In conclusion, this study revealed that a relatively simple education program for implementation of WHO surgical safety checklist was associated with reduction in major post-operative complications and mortality in a hospital with a high standard of care. It is recommended to use the Surgical Safety Checklist in all operative procedures.